Featuring: Joshua Zeman and Rachel Mills. Not Rated (equivalent of an R for violent and disturbing images). Reviewed by Dustin Putman, July 9, 2014. Four years after documentary filmmaker Joshua Zeman's "Cropsey" sought to connect the folklore surrounding the title maniac and a real-life child killer loose on Staten Island in the 1970s and '80s, he has returned with the haunting, thematically similar but wider-scoped "Killer Legends." Exploring the real crimes that likely informed the creation of four prolific urban legendsThe Hook, The Candyman, The Babysitter and the Man Upstairs, and Phantom ClownsZeman and researcher Rachel Mills set off on a cross-country odyssey that would be born out of nightmares were the cases not entirely true. This is absolutely riveting subject matter, insightful in its look at how actual events can be skewed by exaggerated whispers and hearsay like a twisted game of Telephone. To delve into the urban legend of "The Hook," wherein a couple making out at a lovers' lane later discover the hook of an escaped mental patient stuck in their car door, Zeman and Mills head to Texarkana, Texas, home of the still-unsolved Moonlight Murders. In 1946, the town was overcome with fear when five young people were brutally killed byas the sole survivor describeda man wearing a hood over his head. A suspect was never apprehended, but the slayingsand a subsequent movie about the case, 1976's "The Town That Dreaded Sundown"have at once tainted the community and given it a certain intriguing notoriety. Through interviews with local historians and visits to the crime scenes, Zeman offers a unique, up-close-and-personal look at the effects of a notorious killing spree seven decades after the fact. Not about the similarly titled 1992 horror film from Bernard Rose (though it is briefly mentioned), "The Candyman" instead revolves around the parental paranoia of trick or treating. Everyone has heard the stories about unsuspecting children being given poisoned candy and apples with razorblades on Halloween night, but there has never actually been any recorded cases of a stranger handing out tainted goodies. What there have been are parents who have intentionally harmed their own kids and tried to pass it off as the doings of a sick neighborhood psycho. In the Houston suburb of Pasadena, this very thing occurred in 1974 when Ronald Clark O'Bryan laced his son's Pixy Stix with cyanide. The boy died, and Ronald, despite pleading innocent, was sentenced to death for this heinous act. "The Babysitter and the Man Upstairs" gets its moment in the spotlight with a prolific discussion of all the films inspired by this storymost prominently, 1979's "When a Stranger Calls" and its 2006 remakebefore traveling to Columbia, Missouri where, in 1950, 12-year-old Janett Christman was brutally strangled to death while on a babysitting job. Zeman's final destination for "Phantom Clowns" is Chicago, where infamous serial killer John Wayne Gacya clown performerwas convicted of slaughtering 33 teenaged boys and burying them on his property. Years later in 2008, a series of attempted abductions by a person dressed as a clown made the evening news. When Zeman takes a trip to the nearby Cabrini-Green housing projects (the location, ironically, where the aforementioned film "Candyman" was set) to interview residents about whether they have seen a strange clown in the neighborhood, they mostly laugh it off. For them, they have more pressing matters to worry about. 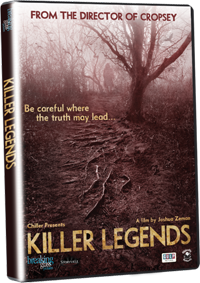 "Killer Legends" is an eerie, insanely watchable documentary with the entertaining Zeman and Mills acting as tour guides to the birthplaces of sobering, unthinkable crimes and the urban legends inspired by them. Late in the picture, there is an attempt to link the painted-faced Joker played by Heath Ledger in 2008's "The Dark Knight" with the orange-haired James Holmes, the 2012 Aurora, Colorado movie theater shooter. Just because he had dyed his hair does not suggest he was trying to emulate a clownish visage, leaving this as the one tangent that feels like a contrived stretch. All the same, "Killer Legends" was tailor-made for true-crime enthusiasts and folklore buffs, of which director Joshua Zeman is obviously one. His passion for the topics he delves into and the creep-factor of all that he finds out about them makes this a documentary that is informative, fun and unsettling in equal measures. DVD from Breaking Glass Pictures.